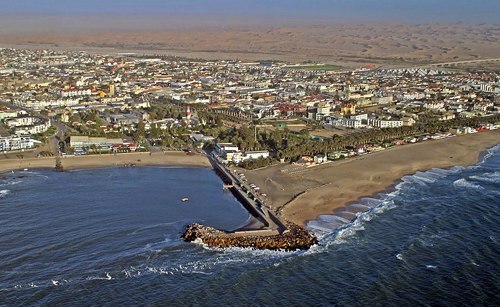 Swakopmund is Namibia’s biggest coastal town and a mecca for Namibians on holiday. Sitting at the nexus between desert and ocean, this is a place with multifarious activities which match its geographical contrasts. The city’s German origins are quite pronounced in beautiful old German colonial buildings throughout the city, which make Swakopmund’s stark contrast even more apparent against the edge of the Namib Desert. Furthermore, since the population of the town is only around 30,000, this is a place you can really make your own. From the desert to the beach, this is a landscape defined by sand. And it’s an ideal location for activities from sandboarding to surfing, or from skydiving to camel safaris. If you’re a wildlife lover, the town is also near Cape Cross (home to scores of beautiful, adorable Cape Fur Seals), the Swakop River, and there are ideal spots for birdwatching too. Flamingos are a popular species, found in the lagoons and flats in the surrounding area. Swakopmund also has an unusual number of skilled rock musicians and an impromptu “Open Mike Night” can usually be organized at one of the local nightspots. Traveling musicians take note! Aside from enjoying the Namib desert by foot and by board, you can also see it from hotair balloon, quad-biking or helicopter. And you’ll definitely want to check it out, as it is widely recognized as the oldest desert in the world with the world’s tallest sand dune. And if you enjoy winding down at the end of an active day with a drink and downtime, we recommend Tiger Reef, a beach bar and all around excellent place for a sunset on the beach. After going to the aquaruim and walking along the beach in the direction of Walvis Bay, stop here to grab a bottle of bubbly for the amazing sunset (Locally called sundowners). This is definitely a remote location for the average expat, but it might just be the perfect home for the right person. It’s certainly a wonderful place for through travelers!